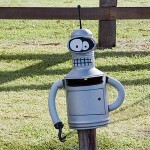 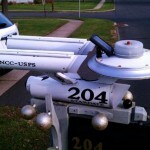 In my neighborhood, everybody’s mailbox is up at or in their front door. 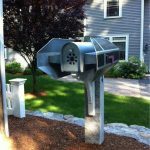 The old curbside mailboxes aren’t something you see a very often and I can think of only a couple neighborhoods in town that are like that. 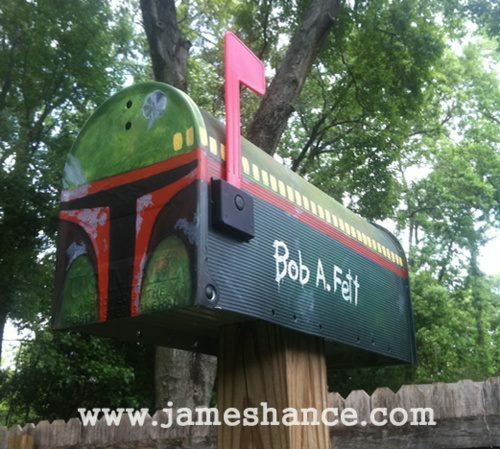 I find that to be a bit unfortunate because there are some great mailbox ideas out there like the Darth Vader mailbox I posted some time ago or in this case, a Boba Fett mailbox! 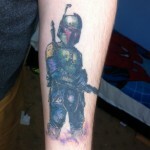 I’m not positive, but judging by the watermark on this picture, I would say this awesome Boba Fett mailbox was created by James Hance for somebody named Bob A. Fett (if this is incorrect please let me know in the comments below as my Facebook friends aren’t that great at crediting the original creator of the stuff they share). 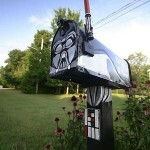 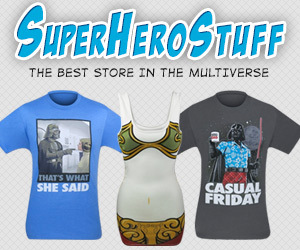 If you are a Star Wars fan looking for a way to geek up your mailbox, this is a pretty good idea!